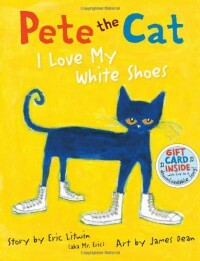 Pete the Cat is back again, and this time he has on some new white shoes. He loves his white shoes so much, even when he keeps stepping in different piles and puddles that change the color of his white shoes. He walks along and sings a song even when things keep going wrong. This story would be great to teach children not to sweat the small things.